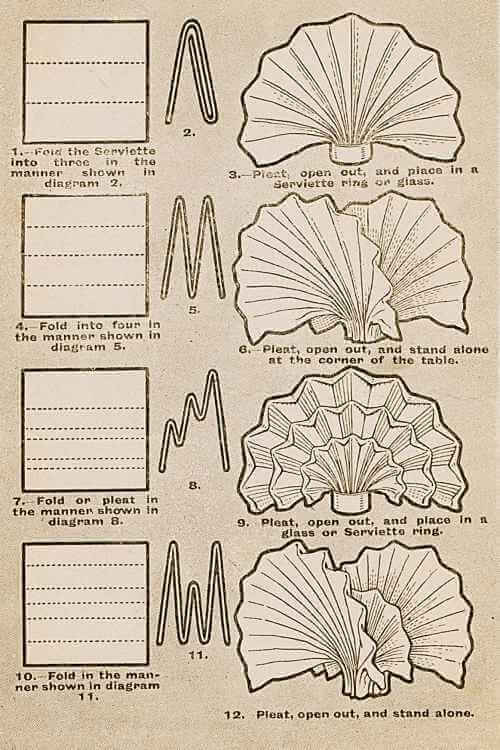 Have fun practicing decorative napkin folding techniques. 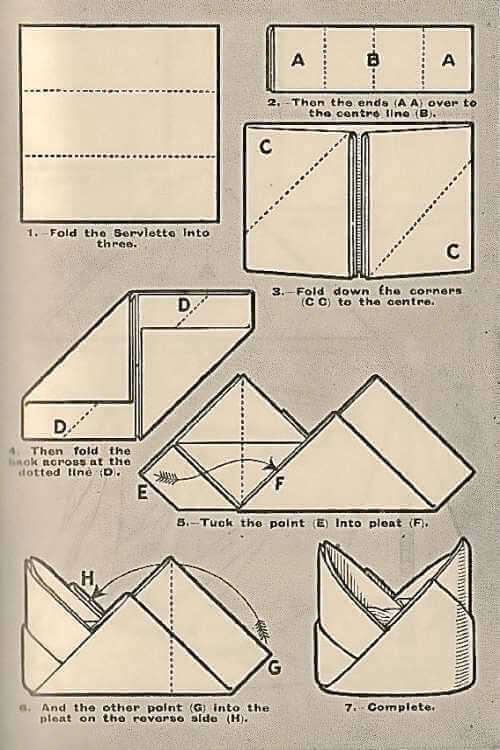 The step-by-step instructions and detailed illustrations will help you learn how to fold napkins into classic folded napkin designs from the Victorian Era that will add class and excellence to any table. By learning the art of folding a napkin in a variety of popular folds, you'll always have a source of inexpensive table decorations for any occasion. 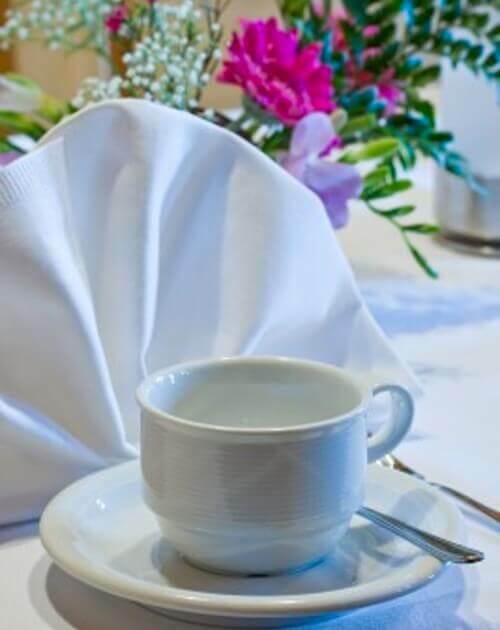 The linen serviettes or table napkins should be neatly and tastefully folded when first put on the table. In ordinary family use they are often folded smoothly and slipped through napkin rings made of silver, ivory, or bone. 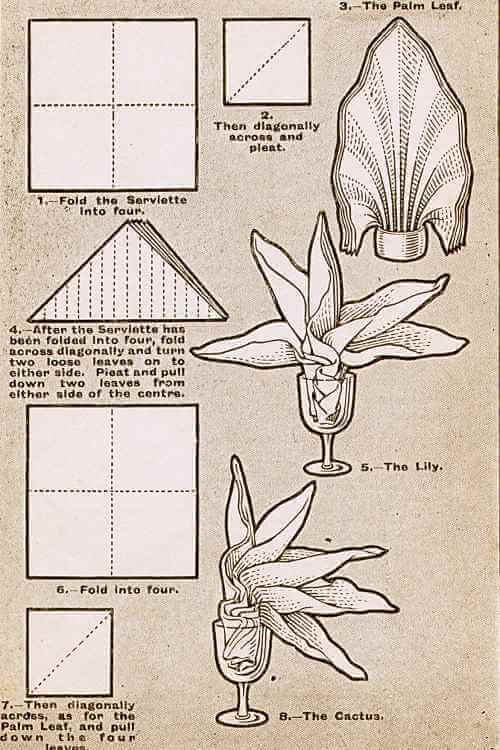 In the following, we give instructions and illustrations showing a few ways of making these useful articles an ornament to the table, but when these fancy designs are not fashionable in the household, the serviette should simply be folded neatly and laid flat on the plate. 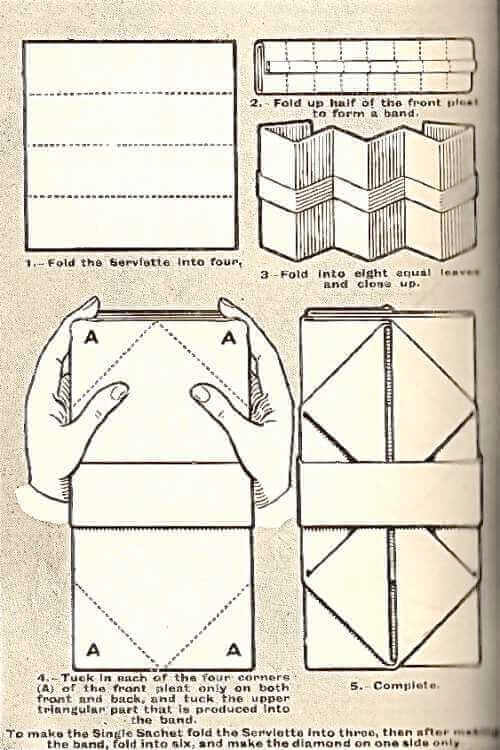 The accompanying engravings depict popular methods of folding linen napkins. 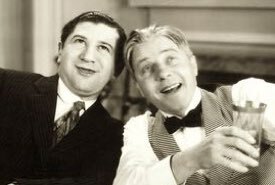 It must, however, be remembered that it is useless to attempt anything but the most simple forms unless the napkins have been slightly starched and smoothly ironed. In every case the serviette folding must be exact, or the result will be slovenly and unsightly. The usual size of these indispensable accompaniments to the dinner table is a square measuring about 20 to 30 inches. 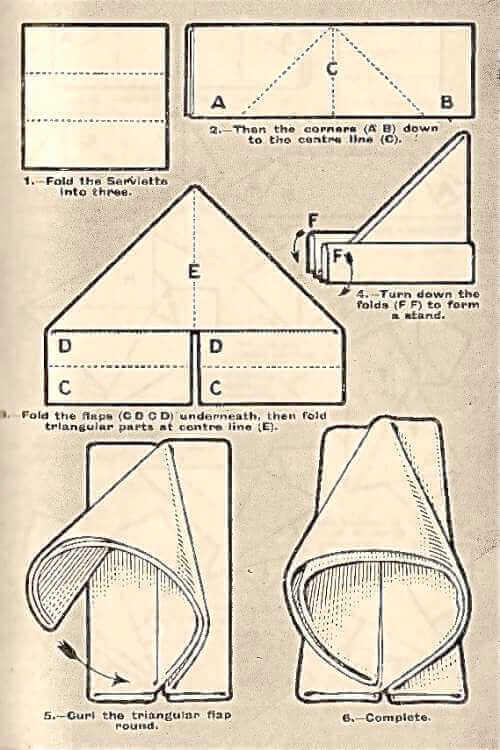 The designs in the following illustrations are worked out with a square serviette, and there is a diagram showing how each serviette fold is made and the effect that is produced in every case. 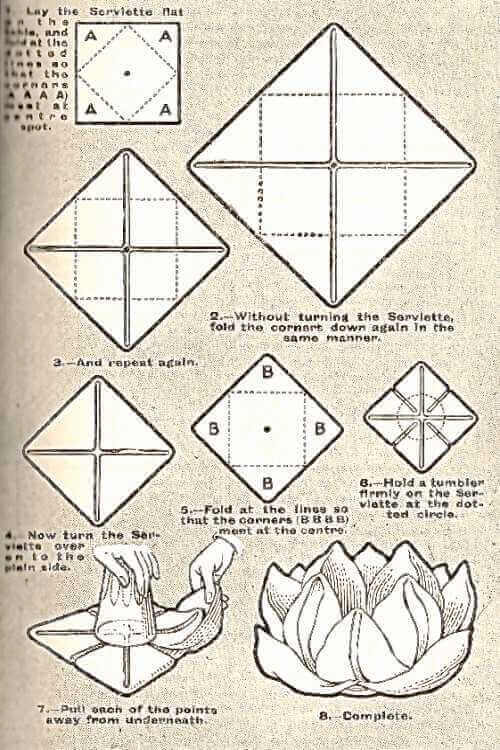 A small dinner roll or piece of bread cut thick, about 3 inches square, should be placed in each folded napkin, when such designs as "The Mitre," are used, and the appearance of the dinner table may be greatly improved by putting a flower or small bouquet in napkins folded into other patterns. 1. 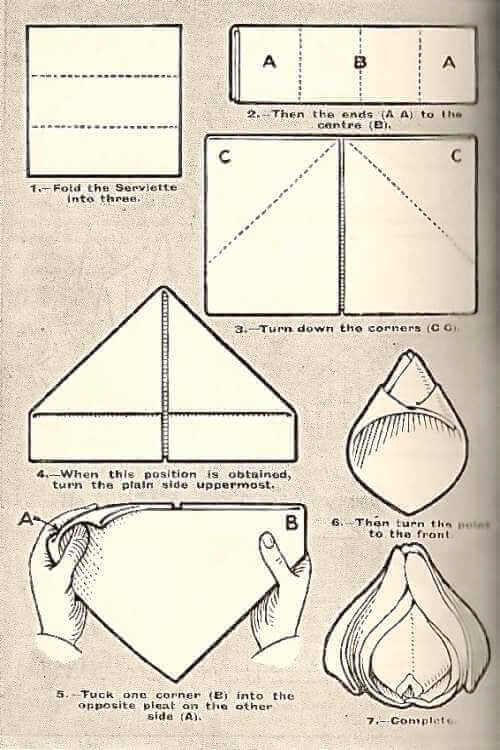 Fold the serviette into three in the manner shown in diagram 2. 3. Pleat, open out, and place in a serviette ring or glass. 4. Fold into four in the manner shown in diagram 5. 6. Pleat, open out, and stand alone at the corner of the table. 7. Fold or pleat in the manner shown in diagram 8. 9. Pleat, open out, and place in a glass or serviette ring. 10. Fold in the manner shown in diagram 11. 12. Pleat, open out, and stand alone. 1. Fold the serviette into four. 2. Then diagonally across and pleat. 4. 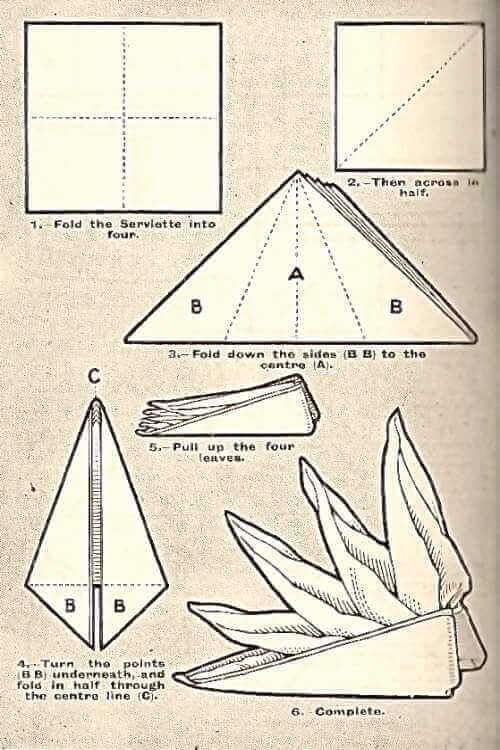 After the serviette has been folded into four, fold across diagonally and turn two loose leaves on to either side. Pleat and pull down two leaves from either side of the centre. 7. Then diagonally across, as for the Palm Leaf, and pull down the four leaves. The Bishops Hat napkin fold design is perfect for supporting either a dinner roll or flower blossom in its center. 1. Fold the serviette into three. 2. Then the ends (A A) over to the centre line (B). 3. Fold down the corners (C C) to the centre. 4. Then fold the back across at the dotted line (D). 5. Tuck the point (E) into pleat (F). 6. And the other point (G) into the pleat on the reverse side (H). 1. Fold the Serviette across at the dotted line (A). 2. Then the two portions (B,B) up at the dotted lines (BB and BB) to the center parts (C,C). 3. Fold across at the dotted line (E) turning up the portion marked (D). 4. Turn down the part marked (F) on to that marked (G). 5. Curl at the base of the triangle. 6. Insert the point of one side (H) into the pleat of the other (J). 7. Pull down the pointed leaves, curl and tuck them into the pleats. The rose napkin fold design when left flat at step 6, is perfect as a base for a wine or water glass. The completed rose design can support a dinner roll or flower blossom in its centre. 1. 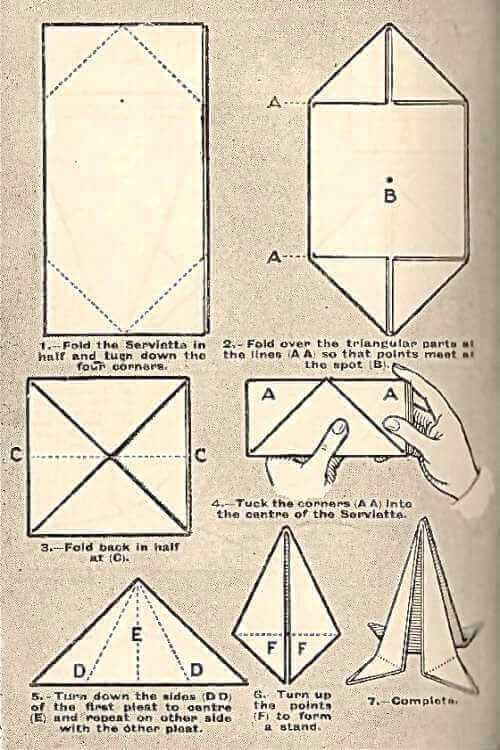 Lay the serviette flat on the table, and fold at the dotted lines so that the corners (A A A A) meet at centre spot. 2. Without turning the serviette, fold the corners down again in the same manner. 4. Now turn the serviette over onto the plain side. 5. Fold at the lines so that the corners (B B B B) meet at the centre. 6. Hold a tumbler firmly on the serviette at the dotted circle. 7. Pull each of the points away from underneath. The open sachet or pocket design is perfect for holding a dinner roll in its curled, open end. 2. Then the corners (A B) down to the centre line (C). 3. 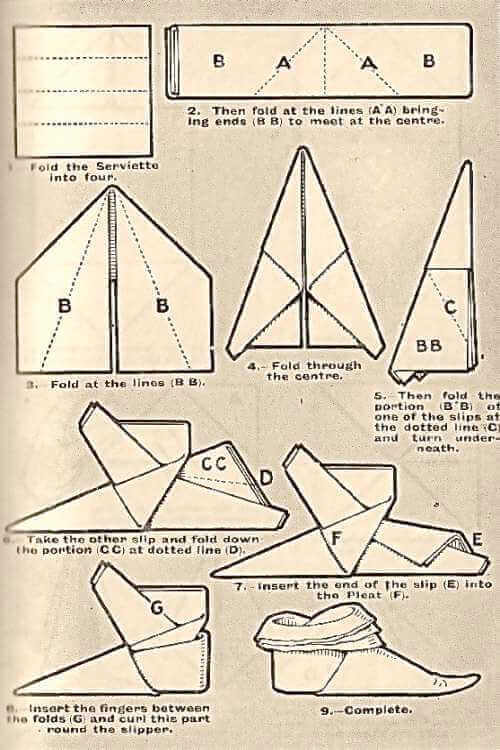 Fold the flaps (C D C D) underneath, then fold triangular parts at centre line (E). 4. 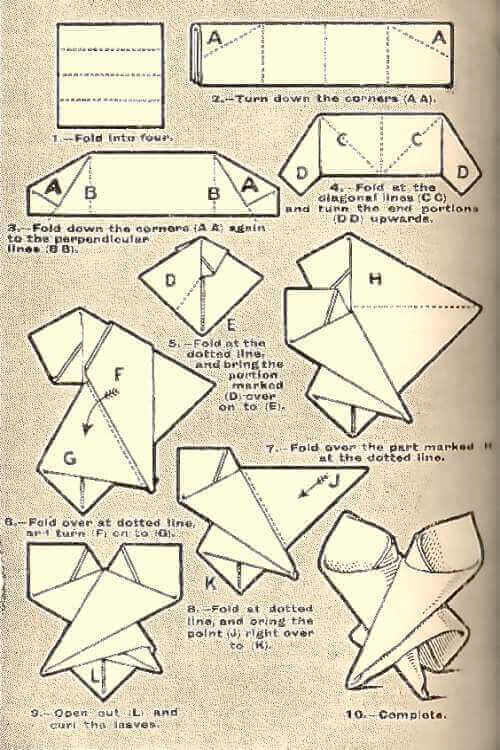 Turn down the folds (F F) to form a stand. 5. Curl the triangular flap round. This folded napkin design is perfect for placing either silver cutlery or a rose beneath the folded band. 2. Fold up half of the front pleat to form a band. 3. 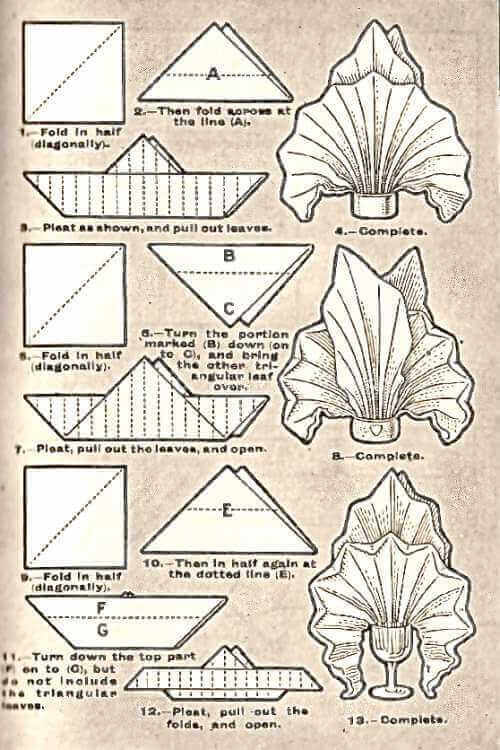 Fold into eight equal leaves and close up. 4. Tuck in each of the four corners (A) of the front pleat only on both front and back, and tuck the upper triangular part that is produced into the band. To make the Single Sachet, fold the serviette into three, then after making the band, fold into six, and make the diamond on one side only. 1. Fold the Serviette in half and turn down the four corners. 2. Fold over the triangle parts at the lines (A,A) so that points meet at the spot (B). 3. Fold back in half at (C). 4. Tuck the corners (A,A) into the center of the Serviette. 5. Turn down the sides (D,D) of the first pleat to center (E) and repeat on other side with the other pleat. 6. Turn up the points (F,F) to form a stand. 1. Fold in half diagonally. 2. Then fold across at the line (A). 3. Pleat as shown, and pull out leaves. 5. Fold in half diagonally. 6. Turn the portion marked (B) down on to (C), and bring the other triangular leaf over. 7. Pleat, pull out the leaves, and open. 9. Fold in half diagonally. 10. Then in half again at the dotted line (E). 11. Turn down the top part (F) on to (G), but do not include the triangular leaves. 12. Pleat, pull out the folds, and open. 2. Turn down the corners (A,A). 3. Fold down the corners (A,A) again to the perpendicular lines (B,B). 4. Fold at the diagonal lines (C,C) and turn the end portions (D,D) upwards. 5. Fold at the dotted line, and bring the portion marked (D) over on to (E). 6. Fold over at dotted line and turn (F) on to (G). 7. Fold over the part marked (H) at the dotted line. 8. Fold at dotted line, and bring the point (J) right over to (K). 9. Open out (L) and curl the leaves. 2. Then fold in half. 3. Fold the ends (B,B) to the center (A). 4. Hold the plain side uppermost and tuck in the corners (C). 5. Fold down the top folds of the pointed parts at line (D). 6. Fold in half at (E). 2. Then across in half. 3. Fold down the sides (B,B) to the center (A). 4. Turn the points (B,B) underneath, and fold in half through the center line (C). 5. Pull up the four leaves. 2. Then fold at the lines (A,A) bringing ends (B,B) to meet at the center. 3. 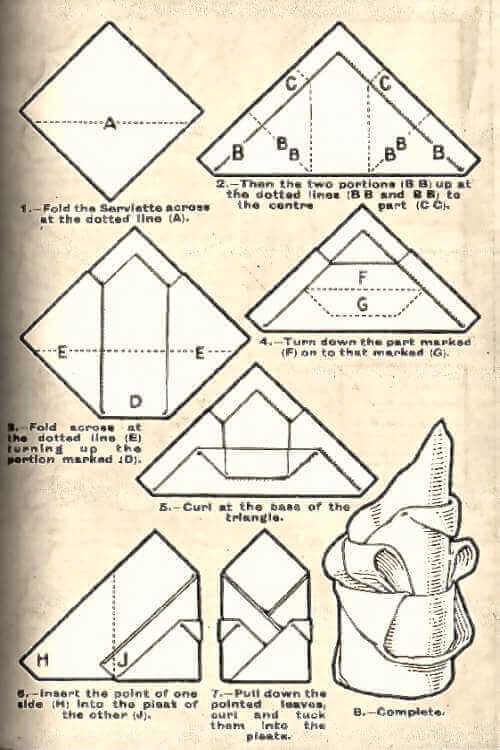 Fold at the lines (B,B). 4. Fold through the center. 5. Then fold the portion (BB) of one of the slips at the dotted line (C) and turn underneath. 6. Take the other slip and fold down the portion (CC) at dotted line (D). 7. Insert the end of the slip (E) into the pleat (F). 8. Insert the fingers between the folds (G) and curl this part round the slipper. Note: The slipper requires much practice to perfect. 2. Then the ends (A,A) to the center (B). 3. Turn down the corners (C,C). 4. When this position is obtained, turn the plain side uppermost. 5. Tuck one corner (B) into the opposite pleat on the other side (A). 6. Then turn the point to the front. 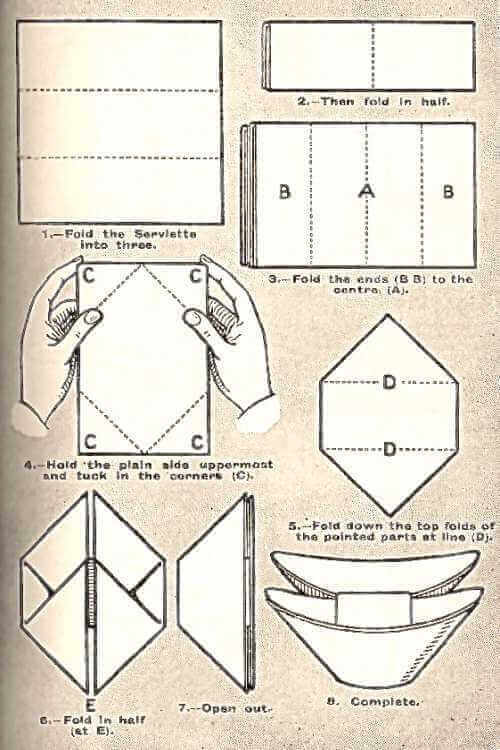 Napkin folding techniques, formally called the art of napery, is an easy-to-learn art form. A properly folded linen napkin in one of the attractive shapes makes a classy yet inexpensive table decoration that's sure to impress. Once folded, the dinner napkins can be placed in traditional napkin rings or within a crystal glass, while some designs are best left standing on their own to impress your most discriminating dinner guest. All this creative hobby requires is a bit of practice and a one-time purchase of the quality linen serviettes to bring years of pleasure. The simpler designs could also be adapted for folding standard paper napkins.